Those who have an eye for beauty often spot treasures among the remnants of everyday life. It’s no wonder that various materials—broken glass, pottery fragments, weathered stones, and relinquished shells—have inspired artists through the ages to create mosaics. Arranging these singularly exquisite little gems to form masterful patterns and images is a practice that dates back to ancient Mesopotamia, and it remains vibrant through evolving methods and interpretations. Having worked with glass for over a decade, Grayton Beach, Florida-based artist Mary Hong uses a unique style called ShardART to produce mesmerizing results. 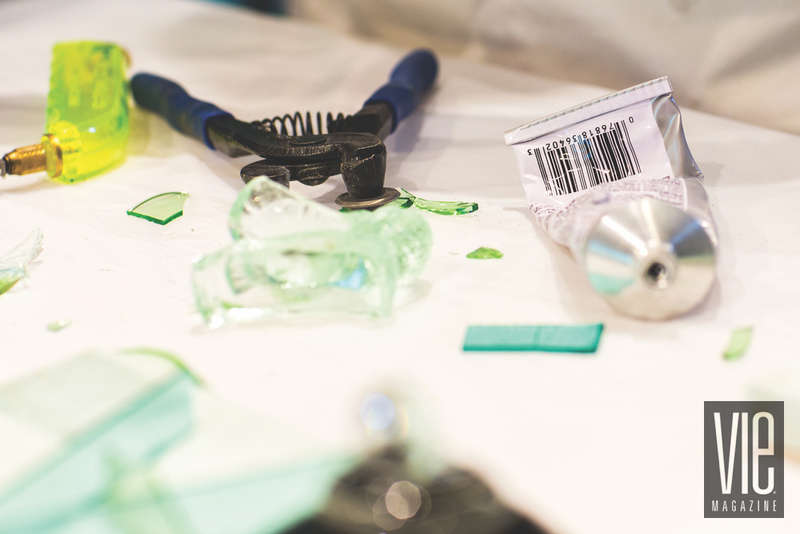 “It’s a mosaic-like technique of applying glass to canvas to enhance a painting,” she explains. “I love glass because it’s shiny and permanent. The color will never fade, and the brilliance of those colors is intense when light passes through. 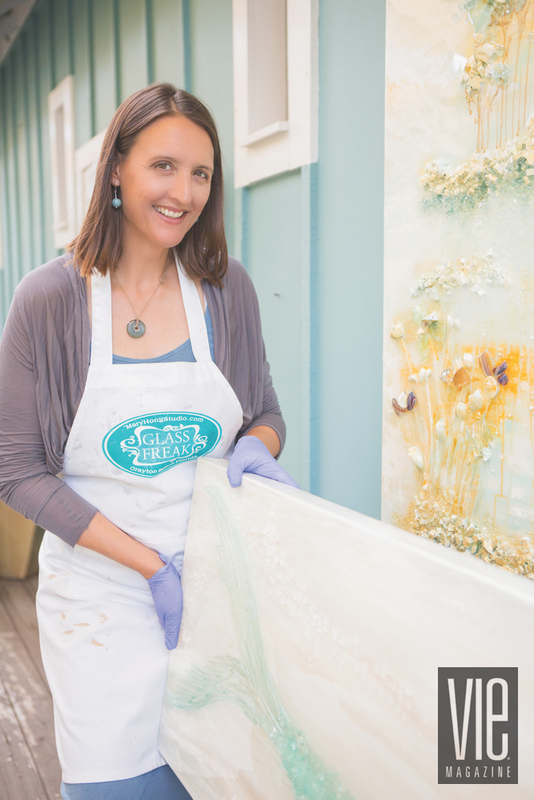 It’s another dimension to color that you can’t get from just paint.” Her first piece of ShardART was a crushed-glass seahorse on canvas. 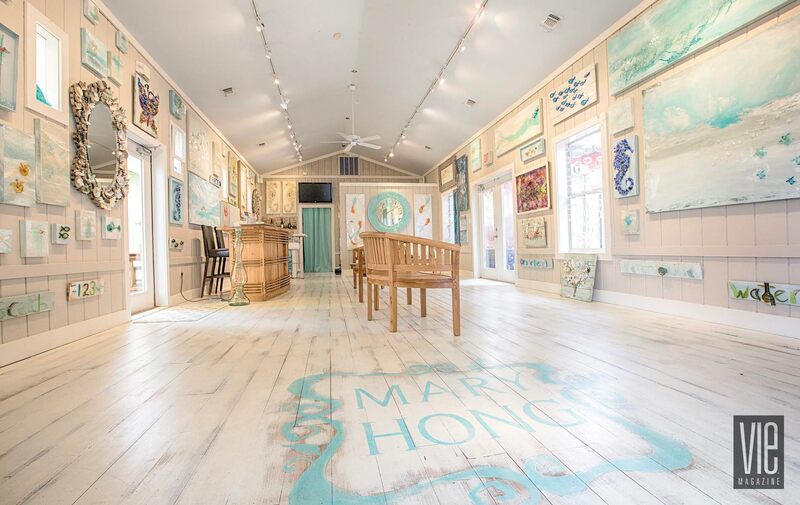 “I loved it and so did everyone else at the show in which it debuted.” Her work earned Hong the honor of being named the 2014 South Walton Artist of the Year. Also appreciative of individuals’ contributions, Hong says, “I tell everyone that I only need pretty glass, and somehow I think we all know what that means!” She simply asks that people not give her any more wine or beer bottles. I love simplicity with subtle hints of insanity on the outskirts. It keeps me on my toes. Besides glass, shells, and jewelry for embellishments, Hong opts for “anything shiny and nonplastic. I use shell casings, porcelain and clay, doll parts and old toys, rusted (or not) metal, Christmas ornaments, plates, tiles. 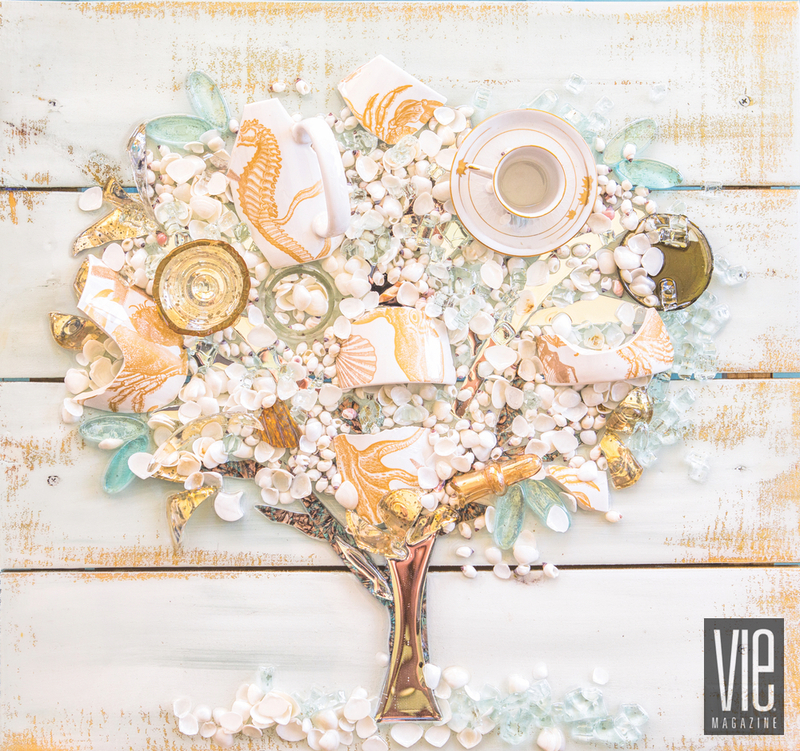 Broken vases and barware are awesome!” The sheer volume and variations of components necessitate order—the glass pieces alone must be sorted according to countless colors and dimensions (for example, chunks, shards, crushed bits, bubbles, and circles). Her creative process begins with a sketch. “I usually sketch everything by hand,” she reveals. “I love to sketch. People would be surprised to see my sketches; they are strong but simple and tell so much!” For more elaborate commissioned projects, Hong produces a mock-up in Photoshop. With the concept defined, she proceeds to a “pretty strong painting” and finishes with glass. Once again suggesting that she prefers to “move along,” Hong completes her work in stages that she likens to mixing, baking, and decorating cookies in batches. “I have days when I paint only canvases—from ten to fifty in a day,” she says, depending on the sizes. “They sit around until I have a need for one. Then there are ‘glass days’ when I lay out the canvases and arrange the glass. Sometimes I have ‘word days’ when I pull out painted boards and make words out of glass on each one. I have ‘tree of life days’ too; I pull out anything round, especially sliced bottles and candle votive holders, and place them in branches.” Hong also devotes time to mirrors, a collection instigated by a designer who wanted an elegant one adorned with shells for a client. I love glass because it’s shiny and permanent. The color will never fade, and the brilliance of those colors is intense when light passes through. It’s another dimension to color that you can’t get from just paint. Hong has always been an artist, she says. “I remember my mom telling me that when I was very young I would draw for hours and couldn’t seem to get enough of the need to create.” Even so, she didn’t consider art classes. “I had no idea art could be taught!” she exclaims. When she was failing Accounting 101 at the University of Wisconsin–Madison, a caring dean opened her eyes by recommending creative courses. Hong graduated with a degree in design. Over the years, Hong’s professional path has taken numerous twists and turns. Interior design failed to hold her interest, so she went to work as a flight attendant. Living in Hawaii and loving the freedom to travel, Hong decided to freelance in graphic design. Encountering shops full of glass beads while on a personal trip to Greece sparked a new love affair; she returned home with a stockpile of them. Hong then tried jewelry making before realizing that the glass itself, not the beads, captivated her. She found a lampworker willing to teach her techniques like firing, annealing, and cutting glass. When she relocated to Northwest Florida with her husband, Hong discovered painting, thanks to an encouraging artist friend. Reflecting, Hong credits each phase of her artistic growth to mentors and others who have inspired her, including her husband and children. Now a teacher, she loves giving ShardART classes at the Shard Shop and homeschooling her eight-year-old twins, Kai and Rain. Meanwhile, the demand for ShardART is strong. In addition to the Mary Hong Studio Gallery and other Florida establishments, galleries in California, Arizona, Texas, and Louisiana now carry Hong’s originals. She’s also pondering the idea of introducing a separate collection of paintings without glass. On the opposite end of the spectrum, John-Richard, a worldwide supplier to the furniture and home accessories industries, is now selling some of Hong’s selected creations as giclée prints with glass. Readers can learn more about Mary Hong and her collections by visiting wiredglass.com or by calling (850) 231-1416. Information about making ShardART—including options for taking in-person or online classes, buying materials, and finding tools—is available at shardshop.com or by calling (850) 231-0544.